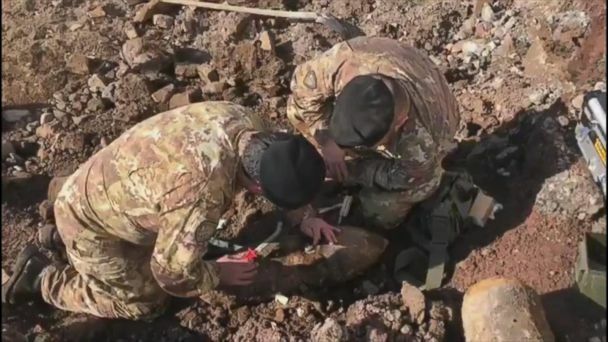 Follow the latest Italy news, videos, and analysis from ABC News. 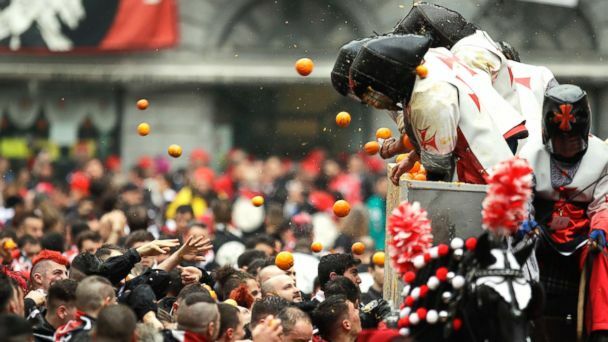 The "Battle of the Oranges" pits nobles against commoners in an epic food fight. 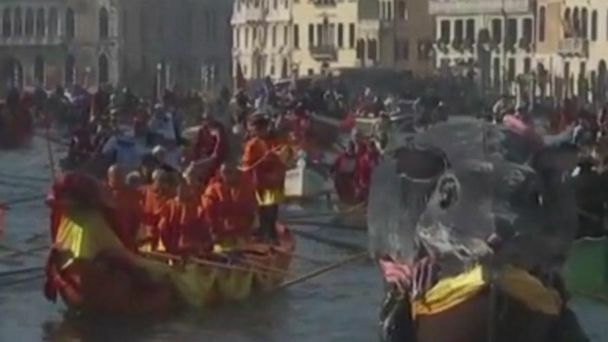 Thousands of people lined the iconic canals of Venice to watch as hundreds of gondolas floated through the lagoon for the annual Venice Carnival Water Parade. 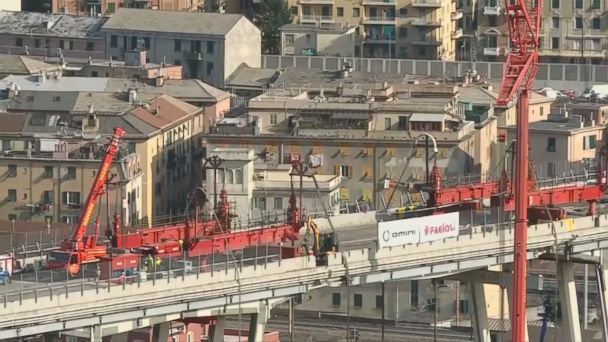 Nearly six months after the deadly collapse of the Morandi Bridge in Genoa, the demolition of the remainder of the span began in earnest Friday. Flights were diverted and passengers evacuated. 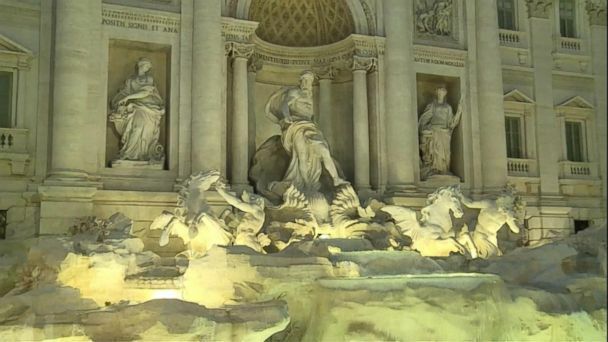 Coins from Trevi Fountain will continue to go to charity, the mayor says. 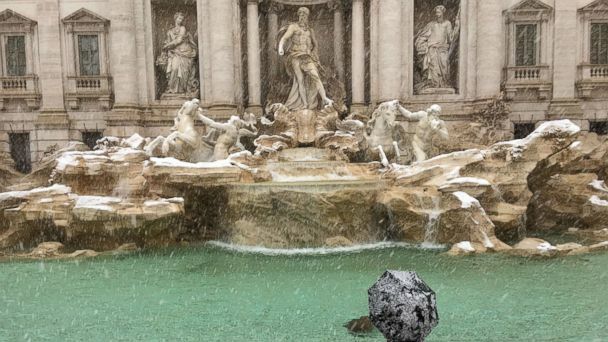 In 2017, the mayor of Rome, Virginia Raggi, proposed the city use the Trevi coins to support Rome's infrastructure and cultural heritage. A teenager and seven other people are being investigated in the stampede deaths. Bystander video shows the panic that left six dead and more than 50 people injured. The worst flooding in Venice since 2012 didn't stop diners from enjoying their pizza. The escalator at a Metro station was packed with soccer fans traveling to a match between Italian and Russian teams. 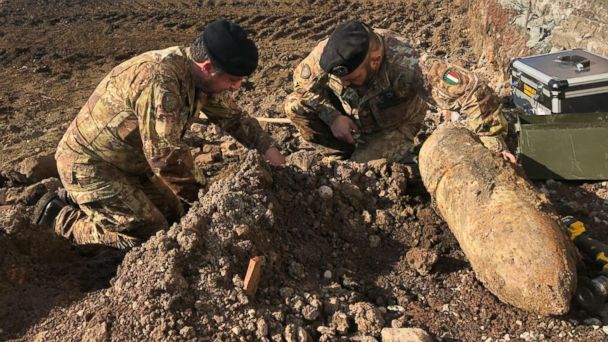 It was an amphora, not a pot, but archaeologists found a literal jackpot in a dig in northern Italy last week. A security camera shows vehicles below the bridge in Genoa as it collapses and creates a cloud of dust. 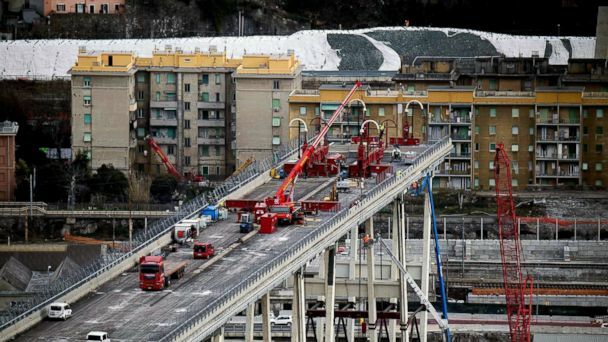 At least 43 people died after part of the Italian bridge collapsed last week. A large section of the bridge buckled, sending cars plummeting 150 feet to the ground. The debate rages over who is responsible for problems that led to its collapse. More than 600 people were evacuated from surrounding buildings as investigators tried to determine what caused the span to fall. The Italian port city of Genoa began two official days of mourning amid an urgent search for survivors of a catastrophic bridge collapse that has claimed 39 lives. Survivors spoke to reporters about how they managed to escape the catastrophic bridge collapse in Genoa, Italy. Rescue efforts are ongoing as the investigation into the cause of the collapse centers on the 51-year-old bridge's maintenance. The death toll is rising as rescuers continue to search for victims in a bridge collapse in Genoa, Italy. Italian officials are investigating what caused the accident that sent 38 cars and trucks nearly 250 feet to the ground in Genoa. A section of a towering highway bridge collapsed in Italy Tuesday, sending cars plunging nearly 300 feet to the ground and killing at least 35 people, officials said. A massive section of a towering bridge in Genoa, Italy, has collapsed on Tuesday, triggering a recovery operation. With the end of a political stalemate, a new government is born in Italy. The passenger train derailed at around 11:30 p.m. local time Wednesday. More than 20 families were reportedly forced to evacuate. A packed commuter train derailed during morning rush hour outside of Milan, Italy, killing at least four and injuring more than 100. 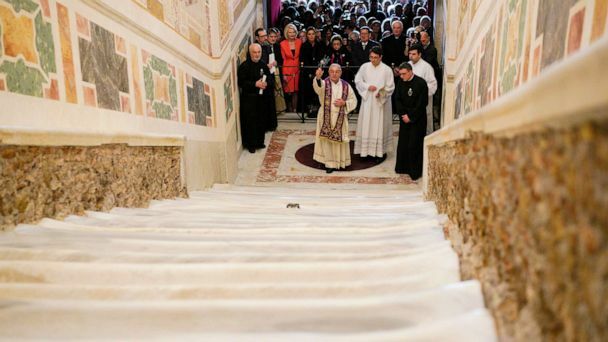 A 52-year-old Spanish man died, local media reported. Firefighters rescued an infant from the wreckage of a collapsed building in Italy on Tuesday after a 4.0-magnitude ripped through the resort island of Ischia, killing at least two people and injuring dozens. Drone footage captures Mount Etna volcano in Sicily erupting, spewing lava and ash into the sky. The volcano's latest eruptions, which can last days and even weeks, began on Monday evening. The giant orange fountains of lava, spewing toward the sky, could be seen in the city of Catania and the resort town of Taormina. Weeks after a deadly avalanche buried a hotel in central Italy under 60,000 tons of snow, new drone footage - and melting snow - reveals the devastation. Emergency rescuers broke down a wall to rescue three puppies buried alive in an avalanche in central Italy. The puppies are in good health. The avalanche was likely a result of 4 powerful earthquakes that hit the same region in central Italy. 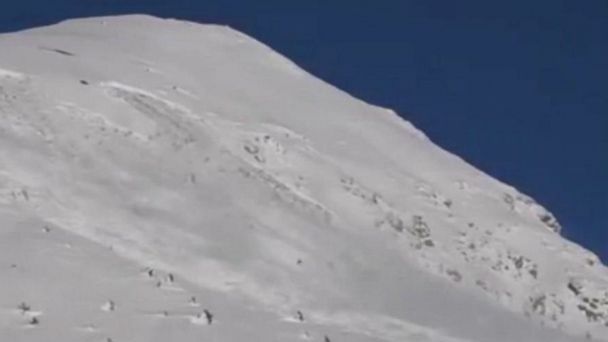 Survivors including a child and mother were rescued from the rubble and snow after an avalanche trapped them inside a hotel in Italy.